Hydra is a beautiful island, traditional and no cars or mopeds are allowed on it. 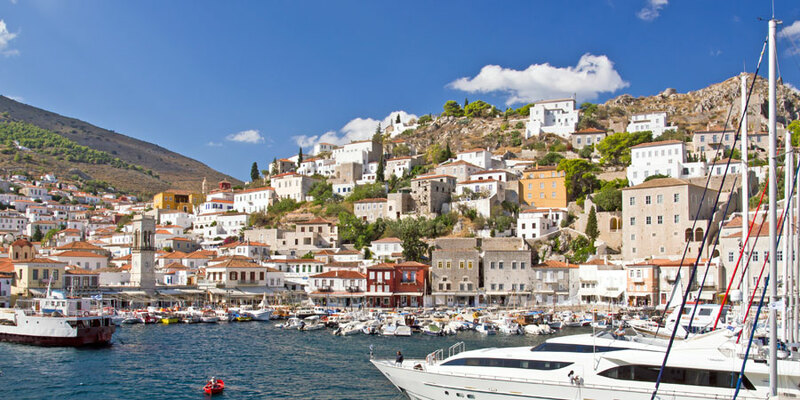 Sail along the coast of Hydra and see the remote small beaches and the historic Captain's houses. Spetses, our destination for the night is another beautiful and traditional island. We swim at Zogeria on Spetses, a blue green water bay with pines going down to the sea and sail to the first capital of modern Greece, historic Nafplion. Naflion is a small city with a lively port, overlooked by a castle that one can visit and many beautiful shops and cafes. Tyros is a small village in a protected bay and a beautiful surrounding. A quiet destination, very different to lively Nafpio. A short sail to Poros, an island separated by a narrow channel from the Peloponnese. Depending on the wind there are many bays to swim. Poros offers many options on cafes, restaurants and bars as well as a very protected port. The longest day in the week, a long sail north with a stop for swimming at Cape Sounion under Poseidon's temple.